The Commit to Georgia Campaign has reached an important campaign milestone: surpassing its $1.2 billion goal. 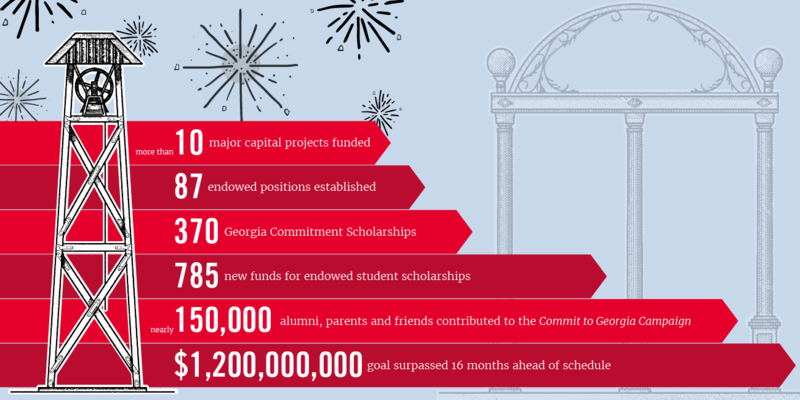 The goal, which was announced in November 2016, was the most ambitious fundraising goal that the University of Georgia has ever set, and it was reached 16 months ahead of schedule. The campaign will continue through June 2020 as planned, and the University of Georgia will continue fundraising for all of its campaign priorities. 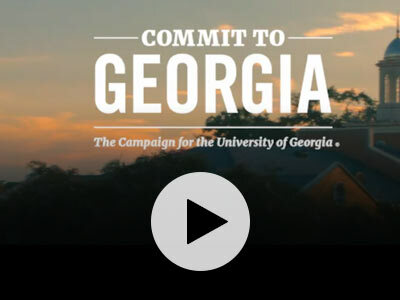 Nearly 150,000 alumni, parents and friends have already contributed to the Commit to Georgia Campaign. Significant progress has been made toward each of the campaign priorities—increasing scholarship support, enhancing the learning environment, and solving grand challenges for our state and the world. UGA donors have created 785 new endowed student scholarships, which will be awarded annually for generations to come. This includes 370 need-based scholarships that were established through the Georgia Commitment Scholarship Program, through which the UGA Foundation matches donor contributions dollar-for-dollar. Donors in the campaign already have helped fund more than 10 major capital projects, including Delta Hall in Washington, D.C., the Veterinary Medicine Teaching Hospital, the new Business Learning Community, the west end zone of Sanford Stadium and the William Porter Payne and Porter Otis Payne Indoor Athletic Facility. They also have helped thousands of students pursue experiential learning opportunities, such as internships or study abroad. In addition, 87 new endowed positions have been created, helping the University to recruit and retain top faculty scholars and researchers.